Prez called Teddy's endorsement "greatest day of his life"
President Obama will eulogize Ted Kennedy, the man whose endorsement helped launch him to the White House. President Obama will repay the man who welcomed him to the Senate as a political neophyte, then helped put him over the top in his historic bid for the White House when he delivers the eulogy for Ted Kennedy. Kennedy, who died Tuesday after a 15-month battle with brain cancer, gave Obama's primary campaign a huge boost when he threw his support to the young senator from Illinois and pronounced Obama the heir to the Kennedy legacy. Obama said the endorsement was "the greatest day of his life," according to Politico. "The torch will be passed again to a new generation of Americans," Kennedy said in his pivotal January, 2008 endorsement. "The hope rises again. And the dream lives on." Obama will no doubt reach for such lofty sentiments on Saturday at a private mass at Boston's Mission Church when he pays tribute to Kennedy, whom he has called "the greatest United States senator of our time." Obama has warmly described how the legendary last brother of the Massachusetts political dynasty had embraced him after he was elected to the chamber in 2004, offering his "wise counsel." Longtime Kennedy adviser Bob Shrum told Politico that it was Kennedy's habit to mentor promising young senators, and that he quickly saw greatness in Obama. 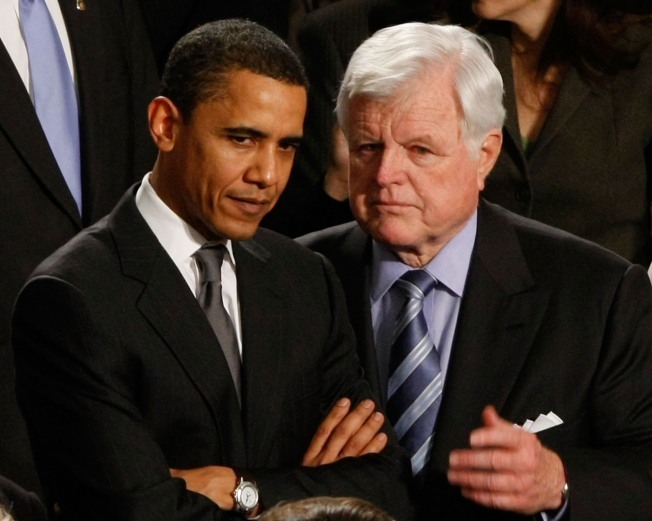 One of Kennedy's first overtures was to recruit Obama to a health and labor subcommittee he chaired. Their relationship continued to grow, long after Kennedy's backed Obama in his bruising primary with Hillary Clinton. "Even as he waged a valiant struggle with a mortal illness, I've profited as president from his encouragement and wisdom," Obama said.